Light: Being inspired. Identifying an important goal. Being given the opportunity to do whatever you want to do. Giving or receiving direction. Seeing a solution. Creating something new. Being aroused, sexually or creatively. Shadow: Failing to take advantage of a great opportunity. Being ineffectual or lazy. Making an inadequate effort. Working toward a goal, but lacking the resources or initiative to achieve success. Setting inappropriate goals. Failing to take a stand. Story: The Main Character has an opportunity to join the story’s quest. Relationships. This could be the start of something big. It’s time to evaluate what you really want; once you do, you can decide whether or not this opportunity can take you there. Be careful: overwhelming attraction can distort good judgment. Work. The only way to stop moving in circles is to define clear criteria for success. What’s the goal? What do you need in order to achieve it? What steps must be taken to get from A to B? This card heralds the need for absolute clarity. Anything less breeds confusion. Spirituality. Where does your spiritual path lead? Walking a path without direction amounts to wandering in the wilderness: you may have some amazing experiences, but there’s no easy way to measure progress. What signs of evolution should you see as you grow? Personal Growth. Where should you be in five years? In ten years? Rather than float like a leaf on the river, consider the value of setting standards for yourself. In addition to defining a direction, give yourself milestones to meet. Before you know it, your dreams will be realities. Fortune Telling. Someone has the “hots” for you. A new job offer is coming your way. Walk softly, and carry a big stick. Types of Wands. 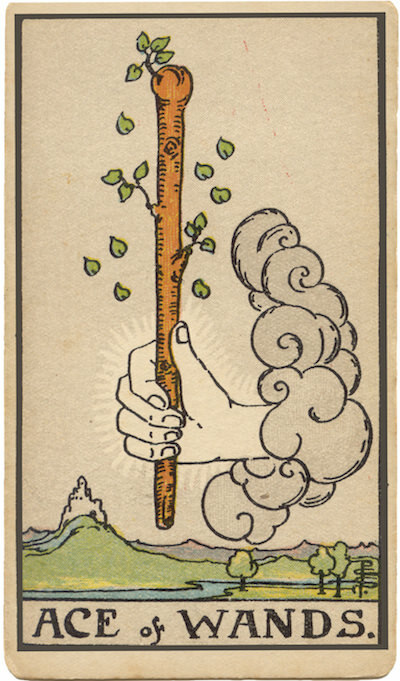 Many decks depict budding Wands, suggesting the potential for growth. Wands in general are a tool for focusing creative energy. In your situation, will growth happen on its own, or will you have to focus your creative energy to move ahead? Wands as a Symbol. As a suit marker, Wands suggest the power and potency of a king’s scepter. When a Magician wants something to happen, he waves his magic wand to make his intentions manifest. What action must you take to convert your dreams into realities? The Nature of the Ace. Compressed into the Ace are all the qualities of all the other cards of the suit. In this way, the Ace can be said to be the “root” or “seed” of its associated element. How might your situation contain the seeds of future action? Your First Impressions. When you see the Ace, what’s your first impression? Is the Wand hovering there, waiting for you to take it? Is the hand offering you the Wand…or moving to hit you with it? What might that suggest about the nature of your desires? What do I really want, more than anything else? What happens if I let this opportunity pass me by? How clearly have I defined my directions, values, and goals?